We Tuff Coat Polymers Pvt. Ltd. are leading paint manufacturers of various industrial Paints, Primers, Lacquers and Thinners from Pune, having manufacturing facility at Ranje near Pune. We are known in Industrial paint manufacturing industry for Quality paint and Excellent Service Provider. We are ISO 9001-2008 Certified Company having our own fully equipped laboratory for raw material and final paint testing. We are specialized in tailor made products required by end users. 15 – July -1997, Prior to that it was partnership firm since 1988. Mr. Shirish D. Ponkshe and Mr. Prasad D. Purandare. Fulfilling Customer demand with Quality and tailor-made Products and Services is our motto. We are always open for innovation in paints as per customers and end user’s need. We at Tuff Coat Polymers Pvt. Ltd. always committed to Customer Satisfaction. 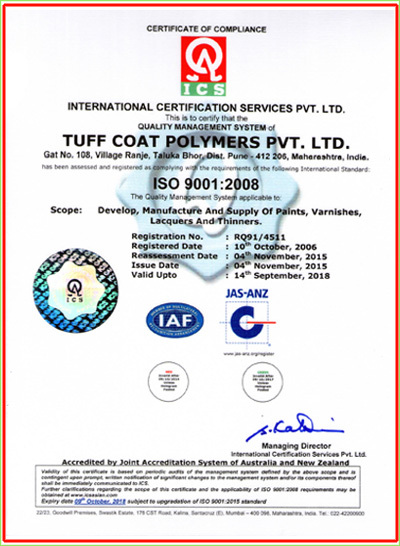 We at Tuff Coat Polymers Pvt Ltd. adhere to provide complete solution to consumers. By providing quality paint systems on time with best economics. We always look to enhance customer satisfaction through continual improvement in our product and quality management system. 3 Nos.each of having 150 liters Volume capacity which gives 300 Liters of paint within 4hrs,. 1 no. having 1 Ltr.of paint per minute production capacity. » Since our major customers are in ISO 9000. We are having strict Quality control measures. To support production and Q.A. Dept. We are having full fledge laboratory with two Quality control chemists who takes the responsibility of quality control with the help of following instruments. List of Equipment For R & D and Testing of Raw Materials Required For Paint. All type of laboratory glass ware to check acid value, amine value, iodine value, free formaldehyde content etc. Hydrometer for checking the density of solvents. We believe, that to sustain in the today's competions we must stick to quality & services, for that we are strictly conducting quality control test for raw material and finish paint. After receipt of raw material, checking it for the weight, the sample is drawn & given to Q.C. lab along with GRR containing all dispatch details. After conducting necessary test the report is given to production dept. with the advice, whether to use the raw material or not. All the records of testing of each raw material is maintained and kept for one year. Our finish paint Quality control starts during the production. All the raw materials are weighed as per production sheet in front of responsible shift supervisor and remarks of additional are marked on productions sheet in front of responsible shift supervisor and remarks of additions are marked on production sheet. During the process interim checking of level of grinding and consistency are checked. After the required grinding stage the material is discharged from the machine & necessary additions are made. After the shade matching, all physical properties like viscosity, drying, shade etc. are checked in factory, if they found ok the sample from the batch is given to Q.C. lab for further testing of all Physical & chemical properties. After satisfactory results, the Q.C.report is handed over to the responsible person for remarks and packing instruction. If the results are not satisfactory, the report of testing along with the remarks is sent to production for necessary action. After the necessary addition as per instruction the sample is again given to Q.C. lab for approval. After the approval of Q.C. lab, the material, is packed as per the instructions and the counter sample is kept with Q.C. lab for minimum 6 months. After the receipt of raw material all the operations till finish paints carried out in our factory premises only. We are not depending on any other source for all our production activities.